US Housing data, ADP Non-Farm Employment Change, GDP figures in the US and Canada, US rate decision and Non-Farm Payrolls are the main market movers this week. Here is an outlook on the major events coming our way. Last week, the number of US jobless claims fell to 284K, the lowest level in nearly 8-1/2 years, indicating the labor market recovery is picking up. The 19,000 fall was contrary to analysts’ expectations of a rise to 308,000. The four-week average declined by 7,250 to 302,000, falling to the lowest level since May 2007. The US economy continues to improve suggesting the Fed may raise rates sooner than planned. Will we see a rate hike in 2014? US Pending Home Sales: Monday, 14:00. The number of contracts to purchase existing U.S. homes surged in May by 6.1%, the biggest climb since April 2010. The reading was far better than the 1.4% addition predicted by analysts, showing a strong rebound in the housing market. Stronger employment conditions as well as cheaper borrowing costs, enable the pick-up in the housing sector. Pending sales are expected to decline 0.2% this time. US CB Consumer Confidence: Tuesday, 14:00. U.S. consumer confidence edged up in June to 85.2 following a downwardly revised 82.2 in May, posting the highest reading since January 2008. Economists expected a smaller rise to 83.6. The expectations index increased to 85.2 in June from 83.5 in May, while the current situation index improved to 85.1 versus 80.3 in May. 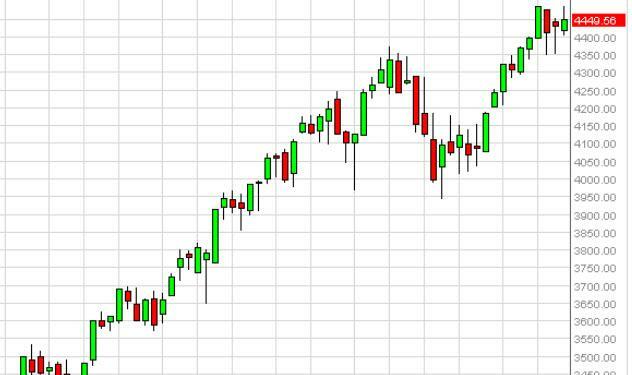 A further rise to 85.5 is expected now. US ADP Non-Farm Employment Change: Wednesday, 12:15. Private sector employment increased by 281,000 workers in June from 179,000 in May, according to the ADP report. Economists’ expected a modest rise of 207,000 jobs. The strong reading reflects continued strengthening in the labor market with a pick-up in Job creation. Private sector employment is expected to expand by 234,000. US GDP data: Wednesday, 12:30. Advance GDP, the earliest GDP measure released in April showed an annual growth pace of 0.1% in the first quarter, falling behind expectations for a 1.2% climb. Weather conditions and sluggish exports, housing and business investment were the main contributors for the shabby growth rate. The Preliminary GDP reading is predicted to reach 3.1%. FOMC Statement: Wednesday, 18:00. The Fed decisions released in June were in line with market expectations. Rates remained unchanged at a range of zero to 0.25% and taper continued on schedule. The Fed expressed concerned about the elevated unemployment rate, however noted an improvement in economic activity. The Committee voted to maintain accommodative stance of monetary policy to support growth. The FOMC downgraded its GDP forecast due to adverse weather in the first quarter. Canadian GDP: Thursday, 12:30. Canadian GDP Growth stalled in April, inching 0.1% as in the previous month, while expected to rise 0.2%. Wholesale and retail activity edged up mildly, while mining and construction output weakened. On a year-over-year bases gross domestic product expanded 2.1%, the same rate marked in the previous month. Canadian economy is expected to grow by 0.3%. US Unemployment claims: Thursday, 12:30. The US Labor market registered a decline of 19,000 claims for jobless benefits in the previous week; reaching 283,000.Analysts expected a rise to 307,000 in the number of claims. This was the lowest reading since February 2006. The four-week moving average declined by 7,250 to 302,000, from the previous week. This is the lowest average level since May 19, 2007. This week’s reading reinforces views that the US economy is matching forward. The number of unemployment claims is expected to reach 306,000. Haruhiko Kuroda speaks: Friday, 3:30. BOJ Governor Haruhiko Kuroda will speak in Tokyo. He may speak about the slowdown in inflation and his plans for the coming months. US Non-Farm Employment Change and US Unemployment Rate: Friday, 12:30. The US labor market showed a remarkable job Addition of 288,000 in June, the strongest reading since January 2012, following a gain of 217,000 in May. Analysts expected a weaker increase of 214,000. This was another sign that the US job market is strengthening parallel to the economic recovery. The unemployment rate fell to 6.1% from 6.3% registered in May, the lowest level since Sep. 2008. Analysts expected rates to remain unchanged at 6.3%. The US labor market is expected to increase by 230,000 jobs, while the unemployment rate is forecasted to remain unchanged at 6.1%. US ISM Manufacturing PMI: Friday, 14:00. In June, the ISM manufacturing index declined mildly to 55.3, from 55.4% recorded in May. The figure was a little below market forecast of 55.6. However, the index still indicates expansion in the manufacturing sector. Declines in production and in supplier deliveries were the main reason for the lukewarm rise. US manufacturing sector is expected to expand to 56.1. 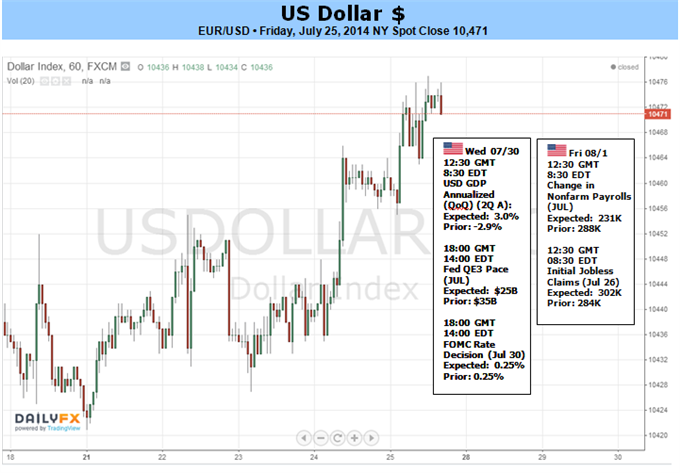 There was little in the backdrop that should have meaningfully bolstered the US Dollar. Interest rate expectations measured through yields and Fed Fund futures were stagnant. Meanwhile, sentiment trends came nowhere near the necessary risk aversion intensity to spur a demand for the haven’s liquidity. And yet, the greenback put in for a meaningful turn. From the precipice of breaking a 17-month range support, the Dow Jones FXCM Dollar Index (ticker = USDollar) has climbed. From the majors, that has manifested in a EURUSD break to 8-month lows below 1.3500 and a tentative GBPUSD reversal back below 1.7000. However, this turn is not yet a reliable trend that can override the general lassitude in financial markets. Yet, that may change in the turbulence of this week’s packed calendar. Though there is a flood of top-tier US event risk penciled in this coming week, three particular releases stand out: the second quarter US growth report (US 2Q GDP), the FOMC rate decision and July nonfarm payrolls (NFPs). These are not only high-profile events with a history of induced volatility, but they are capable of shaping the FX market’s most prominent fundamental themes: interest rate expectations and sentiment trends. Between these two overriding fundamental subjects, the timing and pace of the Fed’s monetary policy is more susceptible to change. Yet, should one or more of these events strike a risk nerve, the potential is far greater. The major event risk will be split into two discrete sessions: the New York sessions on Wednesday and Friday. And, with all of these events, there is worth noting that there is a skew of possible impact to certain outcomes. In the first round of event risk, we have the growth report and policy decision. This past week, the IMF downgraded its 2014 GDP forecast sharply (2.8 to 1.7 percent) after the unexpected 1Q contraction. This tempers expectations even though the Fed and market have maintained optimism for a quick rebound in the 2Q. We will see if that is the case, but a disappointment could be the greater surprise here than a rebound that meets or outpaces expectations. Yet, a weaker pace of recovery is unlikely to materially shift the need for policy normalization. So GDP may prove a more capable risk driver. Later in the same session, this FOMC rate decision will not provide the updated forecasts (on employment, inflation and interest rates) nor Chairwoman Janet Yellen’s press conference. That means, we are left to an expected Taper – third to last if their pace holds – and evaluating the monetary policy statement for tone. The central bank has remained elusive on their timing for a policy shift and its subsequent pace – at least that‘s how markets seem to be treating it. Policymakers cannot pre-commit or they would risk a causing a greater surprise should conditions change and warrant a different policy approach. That said, the interest rate forecasts (often referred to as the ‘blue dots’) are fairly straightforward. They project a first hike in mid-2015, a benchmark rate of 1.12 percent by end of 2015 and 2.50 percent by the close of 2016. Yet, Fed Funds futures, swaps and yields are all discounting that tempo. That is a lot of room to close the gap. Should the combined outcome for the FOMC and GDP leave the market on the fence, the tension will be particularly high for Friday’s NFPs. Yet, the jobs data isn’t only one facet to a more complete picture to develop that day. The Fed’s two primary policy mandates are maximum employment and stable prices. The labor statistics are a clear rudder for the former. Yet also due Friday is the personal consumption expenditure (PCE) report for June. This is the Fed’s preferred inflation measure – rather than the CPI. Where the FOMC decision can seem vague, the combination of these two indicators is straightforward. Last edited by 1Finance; 07-26-2014 at 04:45 AM. USDJPY Rallies to Multi-Week Highs, but What Could Force it Higher? The Japanese Yen remains in a miniscule trading range versus the US Dollar, but a jump in volatility suggests some predict key events ahead could finally force some sharper USD/JPY moves. What keeps the Japanese Yen from much larger price swings? Record-low interest rates across the globe almost certainly play a part; yield-sensitive traders see little reason to buy or sell given expectations that global central banks will keep rates near record-lows. We’ll watch a potentially significant US Federal Reserve interest rate decision and US Nonfarm Payrolls report for USDJPY volatility. The US Fed will almost certainly stick to the script and continue its “Taper” of Quantitative Easing policies, but the devil is always in the details. Traders drove the Dollar to fresh multi-week highs versus the Yen—perhaps an indication of positive expectations ahead of the FOMC meeting. 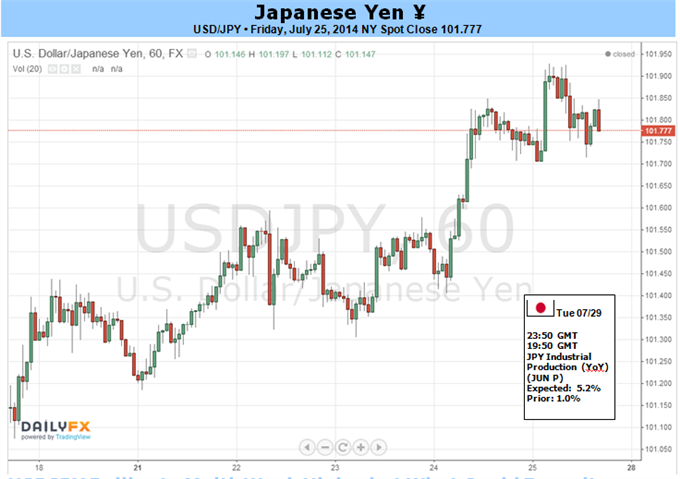 It’s important to note we saw similar price action into the June monetary policy announcement; an initial Dollar surge proved short-lived, and the USDJPY has yet to break above the highs established following the June meeting. The monthly US Nonfarm Payrolls report provides the other important bit of economic event risk for the Dollar/Yen. Economists predict that the US added over 200k jobs in the month of July for the sixth-consecutive month, and lofty expectations leave ample room for disappointment. It would likely take a substantially above-forecast print to force a major Dollar rally, while a disappointment could kill the momentum of positive data for the Greenback. Will the week ahead finally force the USDJPY out of its narrow range? The odds are admittedly low, but a slow build in FX volatility prices suggests some are betting on/hedging against larger moves. Until we see a break of much more significant resistance of ¥103 or support near ¥100.80, however, we expect USDJPY volatility to trade back towards record lows. Last edited by 1Finance; 07-26-2014 at 04:44 AM. 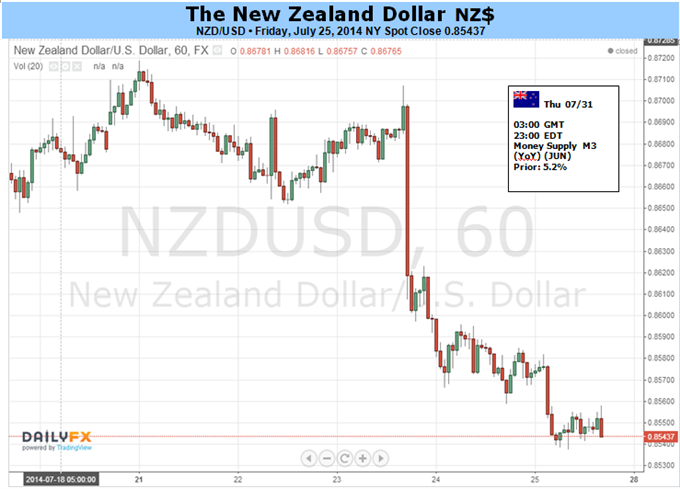 The New Zealand Dollar proved to be the worst-performing currency last week, sliding over 1.5 percent against its US counterpart. The move lower tracked a dramatic decline in New Zealand’s benchmark 10-year bond yield, pointing to eroding RBNZ interest rate hike expectations as the catalyst behind the selloff. A pre-emptive reversal began early in the month amid murmurs of a forthcoming pause in the central bank’s tightening. These fears were confirmed last week as Governor Graeme Wheeler signaled that rate hikes are on hold for time being, sending the currency to the lowest level in nearly two months. Looking ahead, a lull in homegrown event risk will bring external macro-level trends into the driver’s seat. That puts the spotlight squarely on the US, where the docket is so overstuffed that the FOMC policy announcement may actually prove least market-moving among the high-profile releases. Janet Yellen and company appear determined to continue tapering QE until the program is wound down in October. That much is probably priced in already, with the markets now focused on the length of the time gap between the end of asset purchases and the first interest rate hike. That means familiar cautious optimism may not yield much in terms of volatility. Meanwhile, an extensive supply of heavy-duty activity data will speak more directly to how quickly overt tightening may occur. The spotlight will on second-quarter GDP figures and July’s Employment report. The former is expected to show that economic growth snapped back aggressively following the seemingly weather-driven slump in the first three months of the year. The annualized growth rate is seen printing at 3 percent after a dismal 2.9 percent drop in the prior period. As for the jobs report, economists are looking for a 231,000 increase in nonfarm payrolls. That would amount to the sixth consecutive month above the closely-watched 200k threshold, making for the steadiest such run in job creation in over a decade. The significance of Fed monetary policy to supporting risk appetite in the post-crisis rebound from 2009 lows is hardly a controversial subject at this point. That means news-flow arguing for stimulus to be withdrawn relatively sooner than the second half of 2015 – seemingly the markets’ baseline scenario – may force a selloff across sentiment-sensitive assets. Needless to say, the Kiwi’s yield advantage against its G10 FX counterparts puts it firmly on the risk-on side of the spectrum, making it highly vulnerable to selling pressure if broad-based liquidation takes hold. 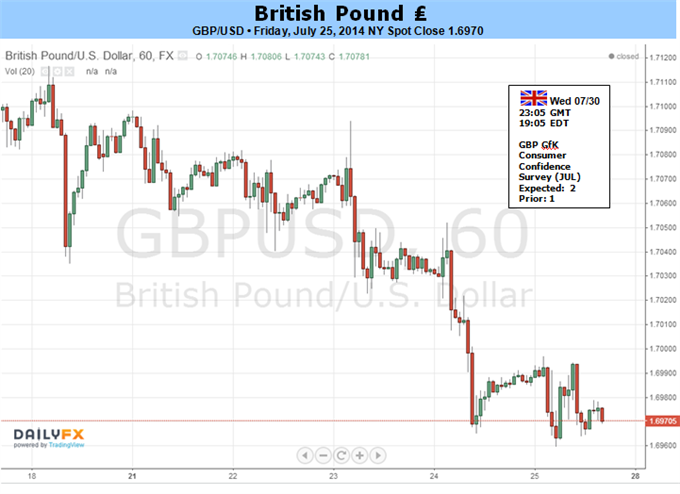 The GBP/USD faced a larger correction going into the end of July as the Bank of England (BoE) Minutes showed a unanimous vote to retain the current policy, but the fundamental outlook continues to generate a bullish bias for the British Pound as central bank Governor Mark Carney sees the spare capacity in the U.K. economy being used up faster than expected. It seems as though the Monetary Policy Committee (MPC) is moving closer to normalizing monetary policy as ‘some’ members see less risk of a rate hike derailing the economic recovery, and it appears as though a growing number of central bank officials are showing a greater willingness to raise the benchmark interest rate later this year as the underlying momentum in the U.K. economy looks ‘more assured.’ Despite the lackluster 2Q U.K. GDP print, the International Monetary Fund (IMF) continued to raise its economic forecast for the region, with the group now calling for a 3.2% expansion in 2014 versus an initial forecast for a 2.9% rise. As a result, the BoE’s Inflation report due out on August 13 may further boost the appeal of the sterling should the central bank adopt a more hawkish tone for monetary policy, and the GBP/USD looks poised to retain the bullish trend carried over from the previous year as the Federal Reserve remains reluctant to move away from its highly accommodative policy stance. With that said, we are still looking for a higher-low in the GBP/USD as price continues to hold above channel support, and the Federal Open Market Committee (FOMC) interest rate decision on July 30 may serve as the fundamental catalyst to spark a resumption of the bullish trend should Chair Janet Yellen continue to highlight a dovish tone for U.S. policy. 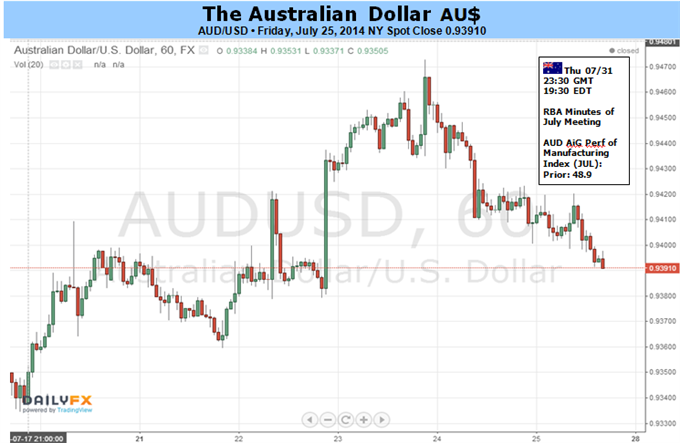 The Australian Dollar is set for a relatively flat finish after a turbulent week that yielded plenty of intraday volatility. An upside surprise to the Australian second quarter core CPI reading, and rise in headline inflation to the top of the RBA’s 2 to 3 percent target band, sent the currency soaring above the 94 US cent handle. Additional strength for the Aussie was found on the back of a bumper China PMI print, as well as an absence of ‘jawboning’ in a speech from RBA Governor Glenn Stevens. Ultimately, most of the gains proved short-lived, which may have reflected some hesitation from traders to push the currency into a region of noteworthy technical resistance. Looking to the week ahead; Building Approvals and the Performance of Manufacturing Index figures represent the only medium-tier domestic economic data on the calendar. However, the leading indicators for the health of the local economy may do little to materially shift the rate outlook, meaning any reaction from the AUD may fail to find follow-through. Similarly, the Chinese manufacturing figures (also on tap) could generate another round of knee-jerk volatility on a surprise reading, yet likely hold do not hold the requisite power to leave a lasting impact on the currency. Indeed, Stevens’ recent address reinforced the prospect of a ‘period of stability’ for the cash rate over the near-term. At this stage it appears unlikely the RBA will change its stance while it attempts to foster a rebalancing of the domestic economy. Implied volatility remains near multi-year lows, suggesting traders continue to price in a relatively small probability of a major economic crisis occurring in the near-term. Traders are seemingly looking past the latest flare-up in geopolitical tensions and have returned to the hunt for yield. Gold prices are softer on the week with the precious metal off by 0.51% to trade at $1298 ahead of the New York close on Friday. The losses come amid continued strength in the greenback with the Dow Jones FXCM Dollar Index breaking into fresh monthly highs as equities struggled. However with the month close at hand, escalating geopolitical tensions abroad and a jam packed economic docket, our bearish bias is curbed as we close the week just above key support. Looking ahead to next week, US economic data comes back into focus with 2Q GDP, the FOMC rate decision and non-farm payrolls on tap. Inflation data early this week was broadly in line with expectations with core CPI even missing expectations by 0.1% to print at 1.9% y/y. In light of last week’s Humphrey Hawkins testimony, where Fed Chair Yellen continued to cite a more cautious outlook on the economy, traders will be closely eying the advanced second quarter growth figures on Wednesday with consensus estimates calling for an annualized read of 3.0% q/q- a sharp rebound from the 2.9% q/q contraction seen in the first quarter. The FOMC policy decision is released later in the day with the central bank expected to stay on course with another $10billion taper in the pace of asset purchases. Look for the policy statement to drive price action should the Fed cite an improved labor market outlook on the back of last month’s blowout 288K print. The July employment report highlights the docket next week with expectations calling for a print of 230K and a hold on the headline unemployment figure at 6.1%. The biggest threat to gold remains a stronger than expected read as such a scenario would likely see interest rate expectations fuel more strength in the greenback. On the other side, the most supportive scenario would be building geopolitical tensions in the Middle East and Ukraine. These events do pose a threat to broader market sentiment with gold likely the biggest winner if the situations were to deteriorate further. From a technical standpoint, gold remains vulnerable below key resistance at $1321/24 with more definitive support at $1292/93. We will continue to eye this level as a key inflection point heading into the close of July trade with a break below targeting support objectives at the 61.8% retracement of the June rally at $1280 and a multi-year pivot zone around $1270. A topside breach/close above $1324 invalidates our near-term approach with subsequent resistance levels seen higher at $1335 the monthly high at $1345 and the 78.6% retracement of the decline off the March highs around $$1360.” We’ll maintain a more neutral stance as prices hold just above support into the close of the month with next week’s event risk and the August opening range likely to offer further clarity on our medium-term directional bias. 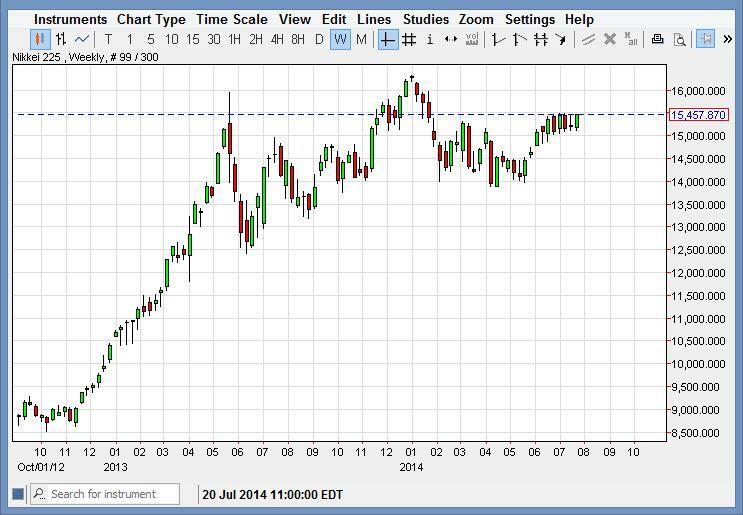 The Nikkei as you can see had a positive week, closing close to the ¥15,500 level. It is not until we break above that level though that we feel confident enough to start buying, and pullbacks at this point in time should simply be an opportunity to pick up value in this market that looks like it wants to go higher. We believe that there is a significant amount of support down at the ¥14,000 level, and it is not until we break below the level that we would be comfortable selling. 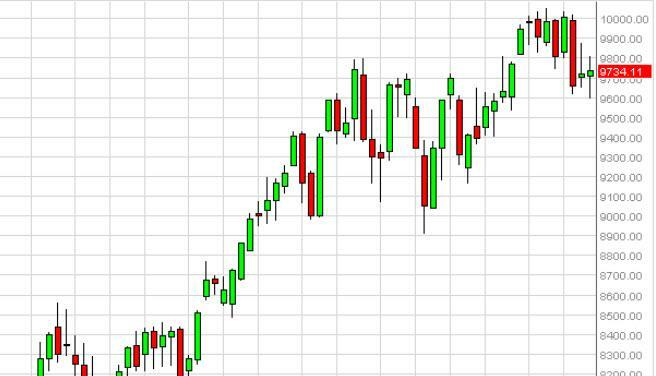 The DAX went back and forth during the course of the week, eventually settling on a relatively neutral candle. It appears that the market is trying to find a little bit of momentum to break out to the upside, as the €10,000 level has been a significant barrier. That barrier should eventually get broken though, it’s just a matter of finding the momentum to do so. 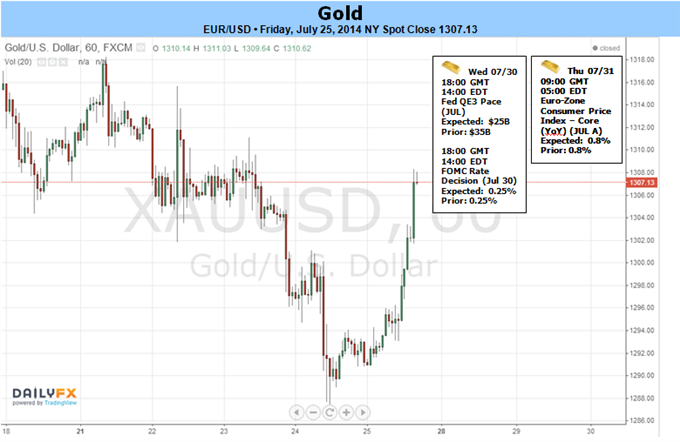 Ultimately, we believe that this market breaks above that level and heads to the €12,000 level. We have no interest in selling this market as it has been so bullish lately. The NASDAQ tried to rally during the course of the week, but as you can see gave back most of the gains. In the end, we ended up forming a shooting star which of course is a sign of weakness, but we have enough support below that we do not feel that the market is ready to break down. Quite honestly, we are more than willing to buy somewhere near the 4350 level in order to take advantage of a significant support level, and as a result we feel that the market will eventually break above the obvious resistance at 4500.